The Center for Advanced Process Systems Engineering “CAPSE” is a multidisciplinary research group focused on the development of advanced computational methodologies for Process Industries and Service Companies. Its members are Researchers, Professors, PhD Students and Outstanding Engineering Students. 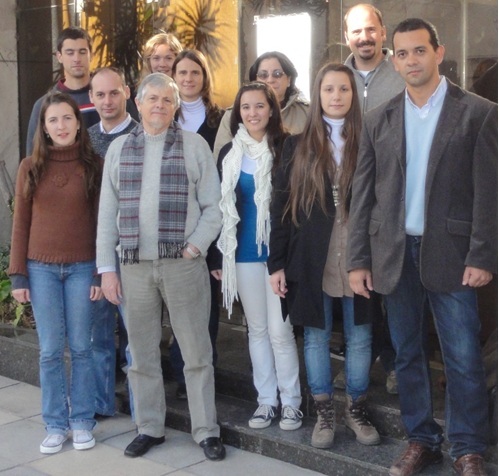 CAPSE labs and offices are located in the city of Santa Fe (Argentine), at the INTEC Research Institute (CONICET – Universidad Nacional del Litoral). •	Understand and aid complex decision making processes arising in manufacturing and service sectors. •	Develop novel modeling methods and advanced optimization-simulation based solution strategies for complex problems in Process Systems Engineering. CAPSE members acknowledge the support received from the Spanish Agency of International Cooperation for the Development (AECID), actions PCI D/024726/09, D/030927/10, and A1/044876/11. Adrián Aguirre is conducting doctoral studies at the department of Industrial Engineering at Polytechnic University of Madrid under the supervision of Prof. Carlos A. Méndez (UNL) and Prof. Alvaro Garcia (UPM). The paper “State-of-the-art review of optimization methods for short-term scheduling of batch processes” by Méndez, C.A. ; Cerdá, J.; Grossmann, I.E. ; Harjunkoski, I.; Fahl, M. is the first one of the 10 most cited articles published in this journal in the last five years. IJORIS special issue on “Applied Optimization & Computing”. Guest Editor: Dr. Carlos A. Méndez. Pablo Marchetti is conducting postdoctoral studies at the Center for Advanced Process Decision-making (CAPD) in Carnegie Mellon University, under the supervision of Prof. Ignacio Grossmann. Jaime Cerdá y Vanina Cafaro attended the International Workshop “PASI 2011”, that took place in Angras dos Reis, Río de Janeiro, Brazil, July 19- 29, 2011. Adrián Aguirre and Carlos Méndez attended the International CYTED-HAROSA Workshop & Meeting on Applied Optimization & Distributed Computing, that took place in Barcelona, Spain, July 18-19, 2011.